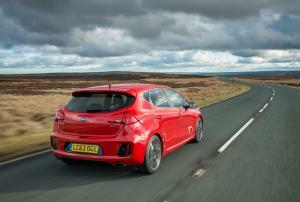 The UK, as we all know, is the hot-hatch capital of the world. Our fascination with souped-up hatchbacks stretches back into the era of synthesised music and dodgy hair, but something in our national psyche means that – even today – we are still the biggest market in Europe for cars with punchy engines and three-letter acronyms on the back. Flushed with success thanks to their recent design-led emergence into the big-time, Kia took the brave step to wedge a Korean toe firmly in a market that’s dominated by the likes of the Golf GTi, Focus ST and Clio RS. It’s a process that started last year with the three-door Procee’d GT. People came. And they saw that it was good. These days, though, many a hot-hatch fan has grown a bit wobbly across the midriff and is often accompanied by snot-ridden children, so something a bit more practical was needed. A GT with a few more doors, for instance. 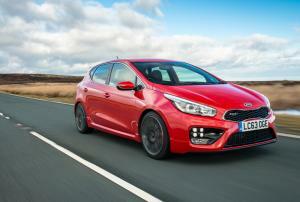 Enter the Kia Cee’d GT, an equally handsome five-door version of its three-door Procee’d twin. From a distance, there’s not much to differentiate one from the other, and that’s a good thing, because both GT models are rather easy on the eye. There’s the prerequisite smattering of honeycomb grilles and an outbreak of gloss-black trim, with much of it shoe-horned into a wider front bumper that’s underscored by an alluring red trim line. 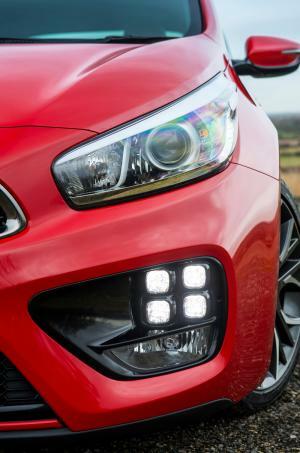 Kia has fully embraced the LED revolution, most successfully with the ‘ice-cube’ running lights, but also with puddle lights in the door mirrors and even LEDs that illuminate the exterior door handles when you unlock the car at night. Around the back, the unabashed sportiness continues with a modest roof spoiler, a chunky rear bumper with vertical red reflectors, and a pair of chrome-tipped exhausts separated by a small diffuser. Hinting that there might be a bit of ‘go’ to all this ‘show’ are the red brake callipers peeking out from behind a tasteful set of two-tone 18-inch alloy wheels, while a pair of subtle GT badges adorn the tailgate and the ‘tiger nose’ front grille. 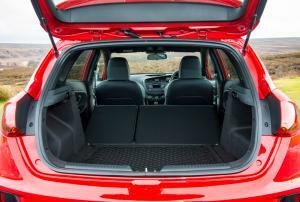 Open the door and the first thing you’ll notice are the impressively chunky part-leather Recaro seats embellished with red GT logos, and they provide not just excellent support but also plenty of adjustment, with power lumbar controls for both. There’s also a rather liberal use of gloss black trim which, although it looks great when new, quickly shows fingerprints and scratches, made worse by its use on all the main contact points such as the steering wheel, door handles, and the leading edge of the central storage cubby. 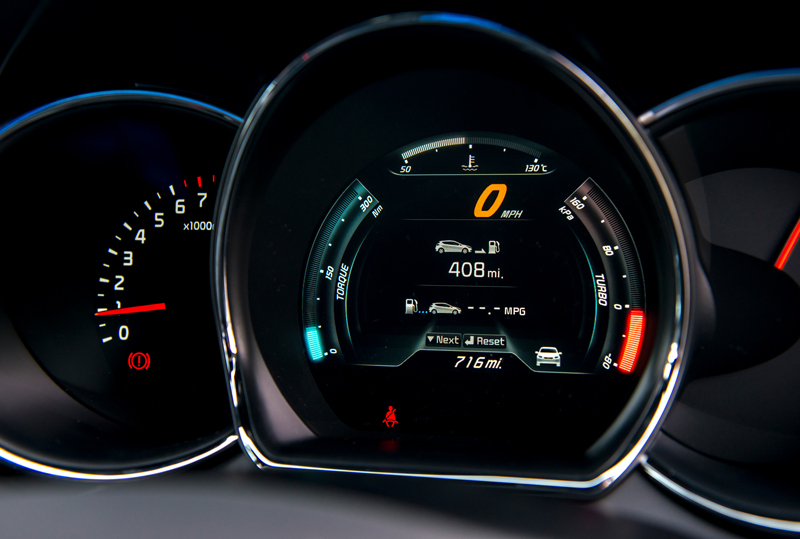 The dash itself is well laid-out, with most of the controls angled towards the driver, while the instruments make use of a high-resolution TFT display that can be switched between two different styles by pressing a ‘GT’ button on the steering wheel. Top-of-the-range GT Tech models also benefit from a seven-inch colour touch-screen in the centre stack that provides audio and navigation functions, and we found the system easy to use, with clear navigation guidance, full European mapping and UK post codes. 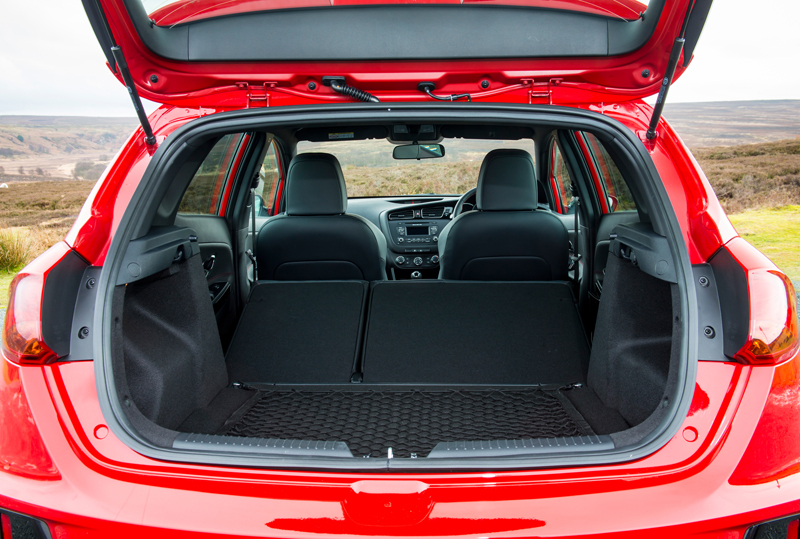 Rear seat passengers of all shapes and sizes should be happy enough, while the split-folding seats allow you to switch to cargo-carrying duties without too much bother. 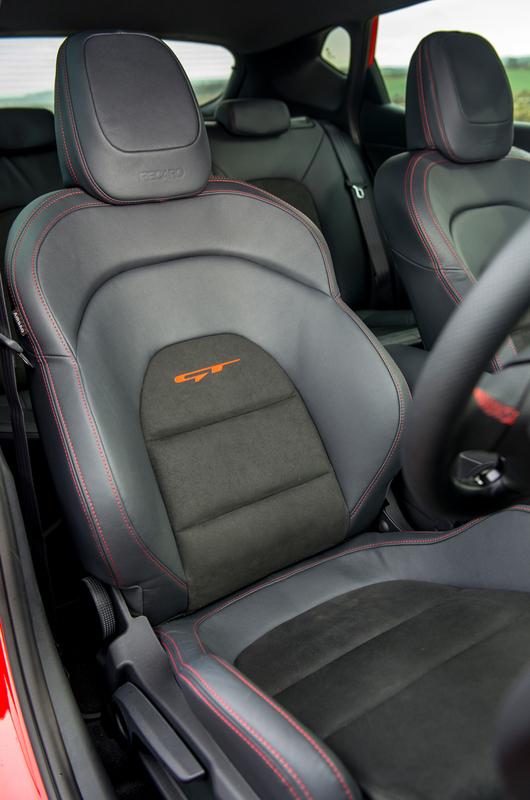 Often neglected on some cars, the seat bases flip up allowing the seat backs to fold completely flat. 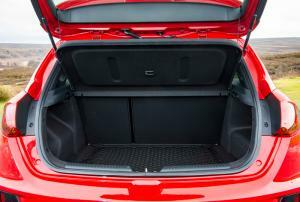 The boot offers 380 litres of space, complete with a handy tray in an underfloor compartment, while folding the rear seats increases that to 1,318 litres. 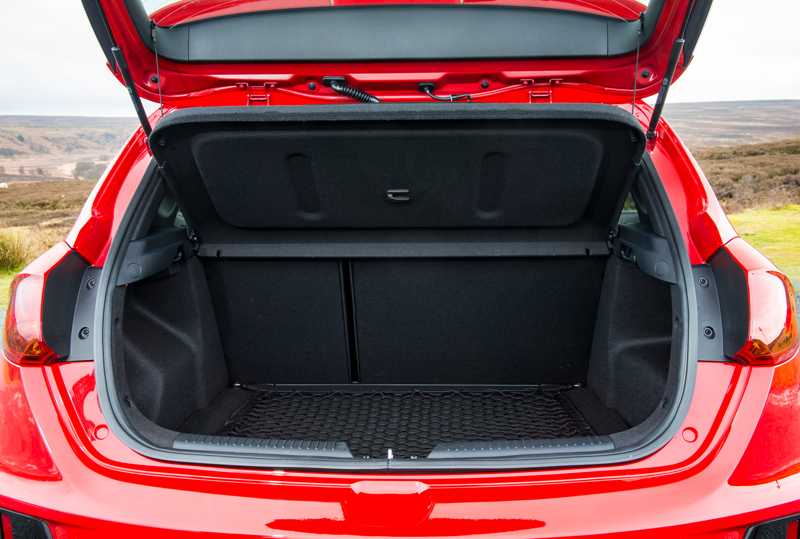 An abundance of tie-down hooks and even a supplied cargo net helps keep your shopping under control when you’re heading out onto the twisties. 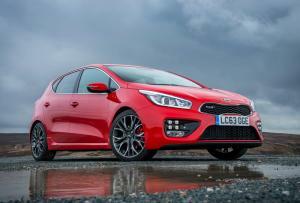 That’s something you’ll want to do often, because shoe-horned under the bonnet is a new version of Kia’s 1.6-litre Gamma engine, augmented by a twin-scroll turbocharger. The result is a rather appealing 201bhp and 265Nm of torque, the latter coming on stream from just 1,750rpm and hanging around all the way until 4,500rpm. That’s enough to squirt the Kia GT to 62mph in 7.4 seconds and on to a 143mph top speed, but it’s the in-gear acceleration that’s more useful, with 37-60mph in 4th gear taken care of in 5.4 seconds, while 50-75mph in 5th is done and dusted in 7.3 seconds. On the road, this all translates into a reassuringly thrusty driving experience, aided and abetted by the slick-shifting stubby gear lever for the six-speed manual gearbox. It’s also capable of a welcome helping of docility around town, where the well-balanced clutch and light steering make urban driving a surprisingly calm affair. Our one gripe, though, would be that while the exhaust has an appealing rasp to it and passers-by will be treated to a series of rally-esque whistling and chirping noises from the turbo, none of this makes it into the cabin. Other than a touch too much road noise, it’s almost too refined in here. 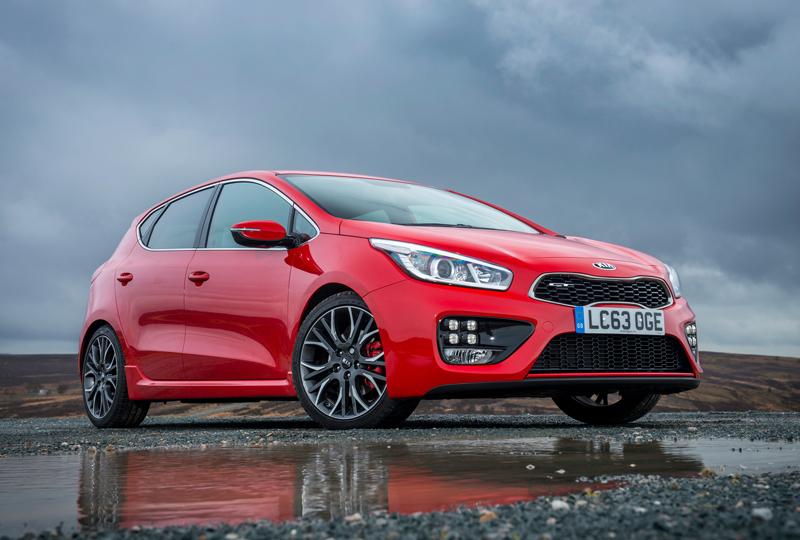 In fact, ‘refined’ is a word that sums up the Cee’d GT well, as rather than tackle the mighty incumbent that is the Golf GTi head-on, Kia instead chose to create something with a greater sense of everyday usability. 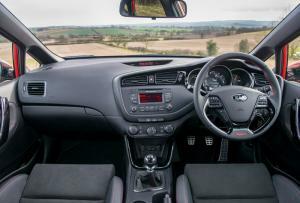 Rather than a raw driving experience that requires PlayStation reflexes, the Cee’d GT is instead a hot-hatch for grown-ups. That’s not to say it’s boring – far from it. The GT relishes the chance to be stuffed into a corner at speed, and it’s here you’ll discover a car that turns-in sharply and holds its line tenaciously. Ok, we admit, the steering is a little short on feedback, and the brakes could be a little stronger, but overall the Cee’d GT responds well and changes direction with aplomb. 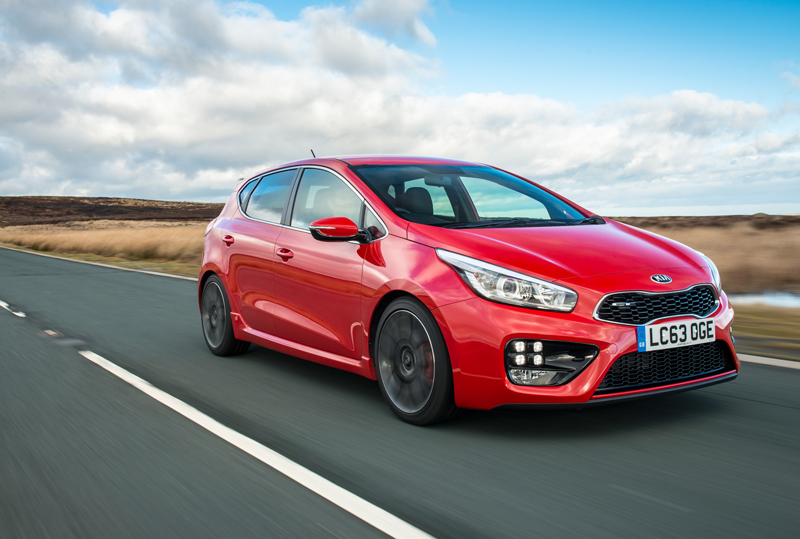 This new-found level of chassis control thankfully isn’t the result of rock-hard suspension, with the Kia remaining compliant across a wide range of road surfaces. It’s definitely firm, but not in a way that becomes tiresome. 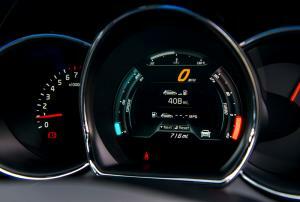 Economy is respectable, with an official combined cycle figure of 38.2mpg. During our time with it, we averaged around the 33mpg mark, with a longer journey pushing that beyond 36mpg. CO2 emissions of 171 g/km place it in VED Band H with a £205 annual bill for road tax. While the Golf GTi can beat nearly all the Cee’d GT’s figures, there’s one set of numbers where the Kia wins hands down, and that’s price – the GT starts at £20,500, compared to the VW’s £26,985. Our GT Tech test car – which gains satnav, reversing camera, heated seats and steering wheel, keyless entry, automatic wipers, dual-zone climate control, auto-dimming mirror, and xenon headlights – wears an enticing £23,200 price tag. Spec a Golf to the same level and you’ll be looking at the best part of £30,000. 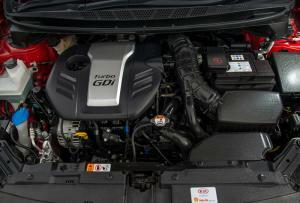 And that doesn’t factor in the Kia’s seven-year 100,000-mile warranty. 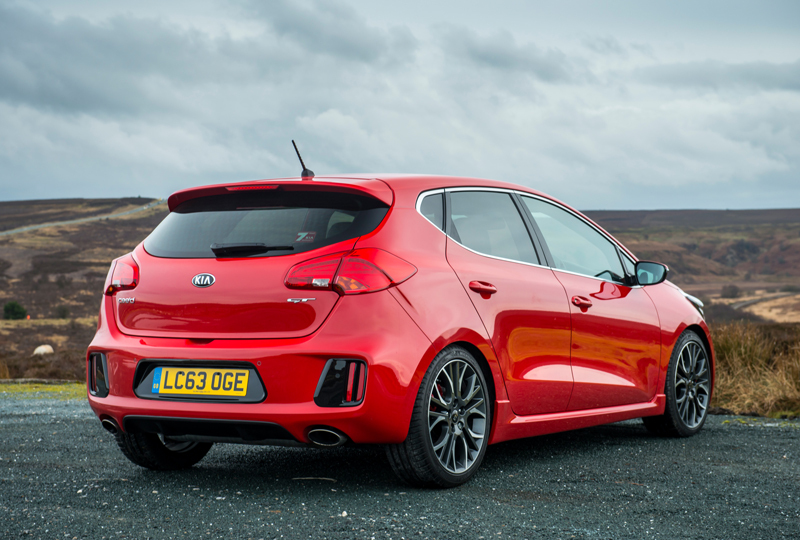 So, while the Golf GTi might be the default choice for hot-hatch hunters, the Kia offers a good nine tenths of the experience for a much smaller outlay. And for our money, that makes the Cee’d GT the smarter choice.